Mrs. Natalia Derkach is not explicitly emphasising it as a gender issue. The fact is that she is the Head of the Appeal Court in the Dnipropetrovsk Oblast. Her Deputy is also a lady. The Head of Apparatus is a lady. The Press officer is a lady. Most of judges (66 out of 97) are ladies. Nevertheless, she enjoys quoting the results of a survey on that: the majority of locals prefer their case to be heard by female magistrates. No-one seeks to draw a rhetoric on it, but the unusually female-dominated regional court makes a difference. “The hand of a woman is visible here”, underlines the regional EUAM’s Mission Manager Mihaita Barbutu. Effective software information ready-to-use for citizens, architectural innovations to make the structure friendly to employees and visitors, a claimed commitment to respect all fundamental rights of the accused, the emphasis on international training and relationships – starting from the European Court in Strasbourg — an impressive record of no less than 25 cases per judge per month, the highest judicial workload in Ukraine. And “without delays”, ensures Mrs Derkach. Dnipropetrovsk’s main Court is not paradisiac, though. It needs more qualified personnel, salaries are not adequate to motivate professionals for such responsibilities (and there’s no public help for those moving from other parts of Ukraine). According to Mrs Derkach, the protection system is weak, as regards with both magistrates and witnesses. Most appalling of all from an EU perspective, are the cells dug up in the basement (as elsewhere here) are shockingly narrow, without any breach for external air and light. However, Mrs Derkach’s openness to speak frankly on all that with EUAM’s advisers emerged as an added value as such. 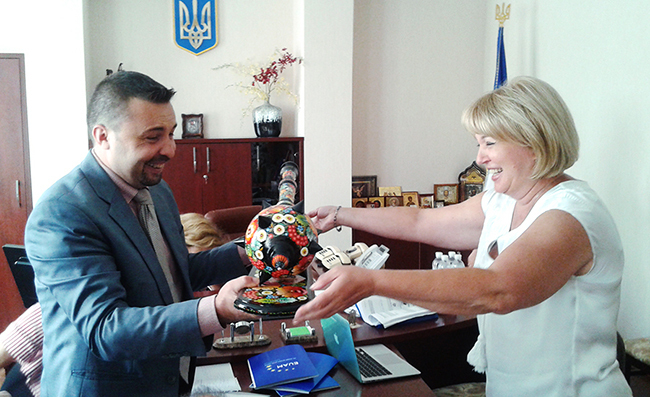 With promising developments and a further weapon: the “Bulova” handicraft that she donated to the EU mission. It is a traditional handicraft symbolizing power. And “power” is a male word in most European languages; but its strongest arms are usually female.